Rome Fiumicino, the larger of the two airports serving the Italian capital, is emerging as a key battleground for European LCCs, in addition to being the last stronghold of struggling Alitalia. Ryanair and Vueling will increase their competition in the Italian domestic market, while easyJet and Vueling will encounter each other more in international markets from Rome. All three will pose a growing threat to Alitalia. On 24-Jan-2014, easyJet announced the launch of five further international routes from Fiumicino this summer, after launching routes to Prague and Nantes in Dec-2013. Its expansion plans will see its capacity in Rome Fiumicino grow by one third in 2014. This follows the establishment at Fiumicino of a Ryanair base in late 2013 and expansion plans announced by Vueling at the airport. Is there room for all the LCCs? – Norwegian Air Shuttle, Monarch, Wizz Air, Pegasus, NIKI and Germanwings are also present at Fiumicino. Will Alitalia be able to withstand the ever growing competitive pressure? Recalling Roman gladiatorial combat of ancient times, this could be a fight to the death. Rome Fiumicino (FCO) is significantly the larger of the two Rome airports, with 36.3 million passengers in 2013, compared with 4.8 million at Ciampino (CIA) (source: Aeroporti di Roma). However, while CIA enjoyed passenger growth of 5.6%, FCO saw passenger numbers drop by 2.1% compared with 2012. The decline at FCO was due to an 8% drop in domestic passenger numbers, which accounted for 30% of the total. International traffic increased by a slender 0.6%, although this masks a 2.2% increase in EU international passenger numbers and a 1.8% fall in non-EU passengers. Ciampino’s growth was mainly driven by EU international traffic, up 5.2%. With the launch of these new routes, easyJet now operates 33 routes to and from Rome Fiumicino, with a total of 154 routes operated to and from Italy. The airline opened its base at Fiumicino in 2009 and currently carries three million passengers each year to and from the airport. The airline expects this to rise to four million annually as it increases capacity by one third in 2014. This makes FCO a key growth priority for easyJet, whose overall 2014 capacity plan sees growth of 5% (financial year to Sep-2014). easyJet's FCO expansion follows similar announcements from both Vueling and Ryanair, meaning that three of Europe’s four leading LCCs are targeting the airport for significant growth in 2014. In Nov-2013, Vueling announced the establishment of a base at FCO. This involves eight aircraft and includes Vueling’s connecting service in the only airport outside its Barcelona home. Its Nov-2013 announcement also specified seven new domestic routes and 17 new international routes for 2014. It has not previously served domestic Italian destinations from Rome. It is difficult to think of a clearer way to stress the strategic importance attached by Vueling to this new base. Where Barcelona acts as a hub connecting northern Europe to southern Spain and North Africa, Vueling sees FCO as “a natural way to access destinations in the south of Italy, Greek islands or Croatia”. The 24 new routes for 2014 add to the nine already operated by Vueling from FCO, bringing its total to 33 (the same number as easyJet) and mainly involve battling with competitors (only two are set to be monopolies). Alitalia is its most common competitor on these new routes, 14 of them, with easyJet a competitor on 12 and Ryanair on seven. It also competes with Fiumicino-based LCC Blue Panorama on eight of these new routes. Ryanair’s Nov-2013 announcement that it would base six aircraft at Rome Fiumicino came rapidly after Vueling announced the establishment of its base at FCO. Ryanair launched three new domestic Italian routes (Catania, Palermo and Lamezia) and two international routes (Barcelona and Brussels) in Dec-2013. It did not operate from FCO previously, but the five new routes come on top of 52 routes operated from Rome Ciampino. It has not indicated what rate of capacity growth this represents in Rome overall, but, purely based on the number of routes, it may be in the region of 10%. This represents significant growth, albeit at lower rates than planned by Vueling and easyJet. Moreover, the strategic importance of Ryanair’s move into FCO goes beyond a pure numerical exercise in calculating growth. In the domestic Italian market, the three new FCO routes add to six domestic routes operated by Ryanair from CIA. The carrier said it plans to transfer many of these domestic routes to FCO, which will become its main domestic airport in Rome. The slots freed up at CIA would be used for international flights at what Ryanair called “the preferred Rome airport for travellers to/from international destinations”. According to data from OAG, this transfer has not yet happened. 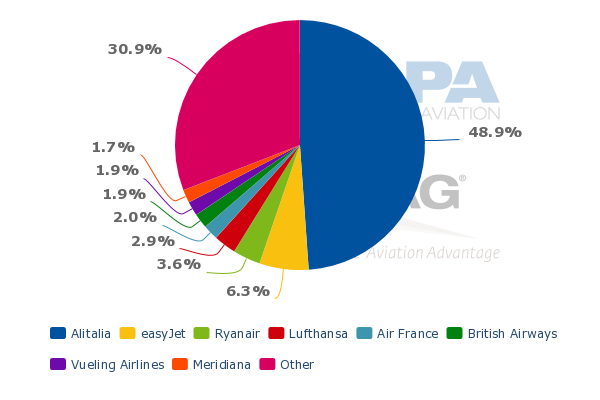 According to OAG data, the only other operator at CIA is Wizz Air, but Ryanair dominates with 93% of seats (week of 27-Jan-2014, source: OAG). Interestingly, none of Ryanair’s domestic Rome routes has any competitors from Ciampino, while competition from Fiumicino is plentiful on most of these routes. It appears that, rather than worry about competition, Ryanair sees more value in focusing its Ciampino niche on the international markets, where there is more growth. Ryanair may also see this as an opportunity to compete airport to airport with Vueling on a number of domestic routes from Fiumicino against the backdrop of a growing pan European battle between the two. Both operate from Vueling’s home at Barcelona and the Nov-2013 announcements from both regarding the Fiumicino expansion followed announcements from both carriers that month that they would establish bases at Brussels Zaventem. Ryanair’s competitive advantage has always been its low costs and low fares, while Vueling perhaps enjoys a perceived advantage in terms of product and service. Ryanair’s recent move to improve the perception of its customer service, added to its low fares, will now be tested directly against one of the LCC sector’s leaders in this area. Alitalia and Vueling are also competitors on Ryanair’s two new international routes from FCO: Barcelona and Brussels (Brussels Airlines is a further competitor on the latter route). For Alitalia, LCC growth at FCO is worrying. By far the Italian national carrier’s biggest hub, it is the number one carrier there and has almost four times the seat capacity at Fiumicino that it has at its number two airport, Milan Linate. 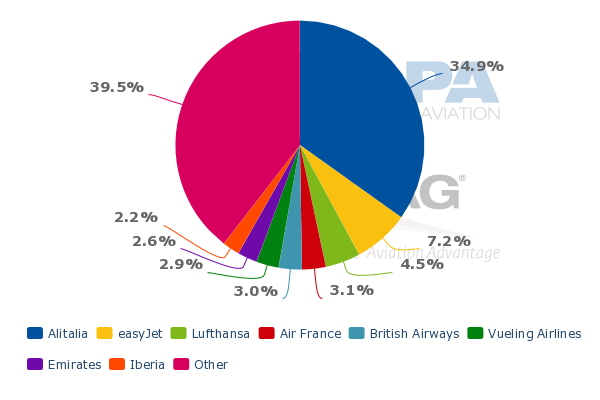 More than half of Alitalia’s seats at FCO are in the domestic market. 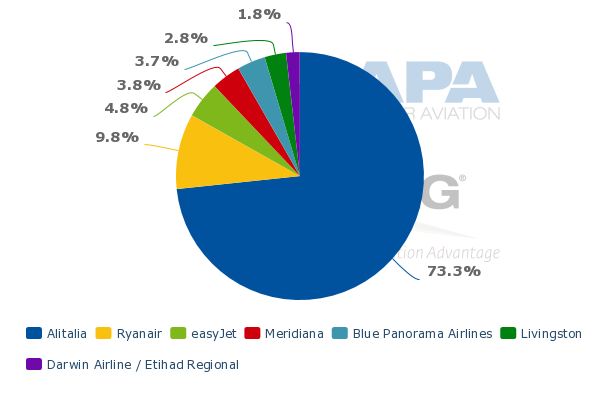 All of Ryanair’s seat capacity at FCO, and around one quarter of easyJet's (although none of its new routes), is domestic. In addition, seven of Vueling’s new routes from FCO are domestic. Alitalia will not welcome this growing presence of Europe’s leading LCCs in its main hub, particularly if Ryanair implements its plans to transfer domestic routes from CIA. The erosion of Alitalia’s domestic market share will also put further pressure on its international operations, which need domestic feed. More directly, the expansion by Vueling and easyJet at FCO will significantly add to Alitalia’s challenges in its international network. 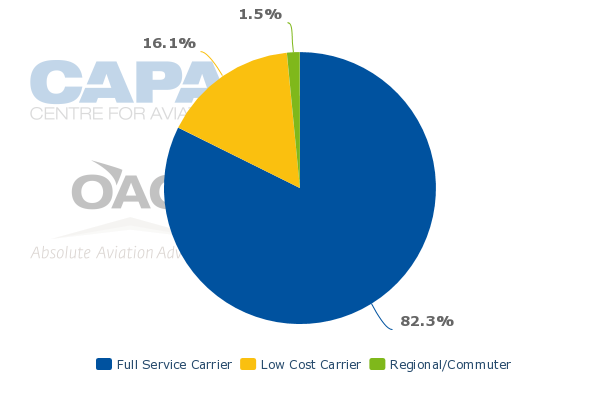 According to OAG data, LCCs have 16% of seats at Fiumicino (week of 27-Jan-2014), although this is higher in the northern hemisphere summer and it was around 20% for 2013, a level at which it had roughly remained since 2008. Alitalia’s share of seats at FCO has actually held up quite well: it was 41% in 2008 and 45% in 2013, although it is on a slight downward path after peaking at 46% in 2011. It seems that, until now, the main losers from the growth of LCCs at FCO have been Meridiana and carriers with only a small presence at the airport. The leading European legacy flag carriers’ share has been broadly stable. See related report: Meridiana: how to escape the impact of loss-making Italian airlines? In 2014, the leading LCCs’ expansion plans look set to accelerate this decline in Alitalia’s share of Fiumicino capacity. 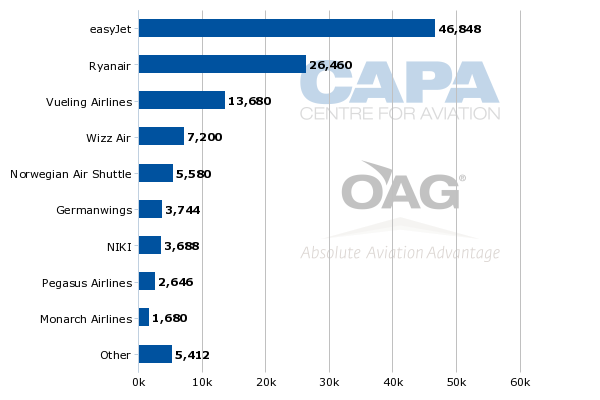 easyJet's 2014 capacity does not yet appear in OAG data for the summer schedule, but combining the OAG data with easyJet's planned one third capacity growth in 2014, we estimate that LCCs will have 24% of FCO seats and Alitalia’s share will fall to 42% in 2014. Given the superior load factors of the LCCs, their passenger share will be greater and Alitalia’s will be lower than these figures. Will Alitalia be rescued from the lions? Although it has recently raised EUR391 million through a recapitalisation and bond conversion, Alitalia remains far from financial security. It is fast running out of last chances as it lurches from refinancing to refinancing and industrial plan to industrial plan. Air France-KLM is reportedly still considering an investment and Etihad has been in talks about taking a stake; Alitalia still has at least some prospect of a more stable future - but it is increasingly a buyer's market. Rome has long been a place to witness a spectacle. The lions are hungry and have entered the arena. Will someone mount a last minute rescue?